CARRY’s Social Skills program offer etiquette classes on manners, dining, grooming, appropriate conversations, listening skills, and showing self-control, to name just a few of the subjects covered. Our social skills workshops are incorporated into our monthly Esteemed Growth Camp. CARRY has successfully taught social skills classes to more than 300 high school and junior high youth. 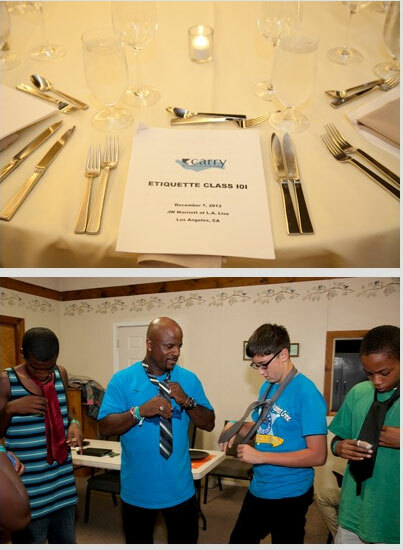 In addition, CARRY conducts etiquette lunches or dinners, orchestrating 4-5 events per year. Our students are taught “the art of dinner,” from responding to the invitation, and appropriate dress, to appropriate dinner party conversation and sending a thank you note. This program is vital as studies indicate that strong social skills are essential for long-term success. Children with great social skills experience the rewards of better relationships. They perform better academically and show enhanced self-image.